(1). 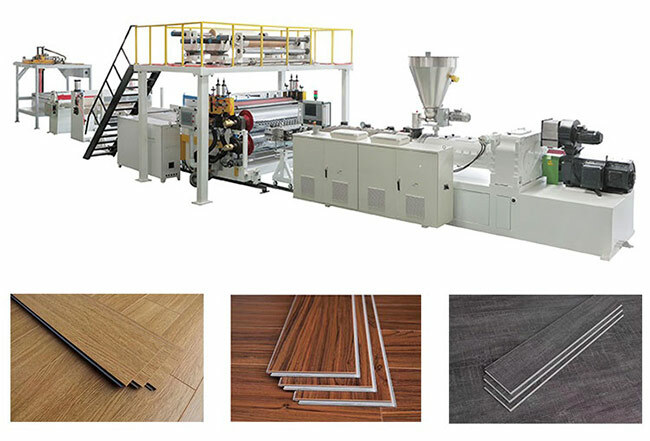 SPC flooring production line with green and environmental protection, non-toxic and harmless, no radioactive pollution, no pollution to the environment, green environmental protection products, recyclable. (2). Super wear-resistant: PVC surface has a special high-tech processed transparent wear layer with super wear resistance. Therefore, PVC floors are becoming more and more popular in hospitals, schools, office buildings, shopping malls, supermarkets, and transportation places with large traffic. (3). SPC flooring production line with waterproof, moisture-proof, non-deformable water, non-slip PVC material, strong slip resistance, can eliminate the worries of the elderly and children. (4). Tough and elastic: anti-impact, comfortable feet. (5). High safety, insulation, flame retardant, corrosion resistance, acid and alkali resistance, 5% acetic acid. 5% hydrochloric acid, no abnormalities on the surface. (6). The color is novel, a variety of colors are available for selection, the colors are beautiful, the nature is realistic, and any combination of colors and colors is formed to highlight the individual color. (7). Quick and convenient installation, convenient construction, sawing, planing, nailing, glue-free paint. (8). The service life can be as long as 20 years or more.